Mummy wars, breast vs bottle, working mum vs stay at home mum, public vs private. You would be forgiven for thinking that being a parent means that you have to be a prized fighter to get anywhere. Some days it does feel like every man and their dog has a say on what you are doing wrong (rarely is ever right) as a parent. Not being a good parent and feeling judged because of my scars is something that I really struggle with and it is one of my soft spots. It doesn’t take much to push me over the edge of self doubt and Paul has received many a hysterical phone call over the last almost six years. Last week I came across this post about a small family who found themselves under the judgmental eye of a stranger. It’s always a stranger and I just don’t understand the motivation behind feeling the need to put your two cents into a situation that has no impact on you. Does it really hurt you if a parent decides that they want to carry their two year old instead of letting them walk? I’ve been on the receiving end of the ‘well meaning’ (and I use that term loosely) interference from people who believe that they have a right to have their say about my situation. It grates on me every time and it knocks my self confidence. They are judging me on that snapshot of parenting, making a call based on the sometimes seconds of information that they have received. I have had people yell at me from their cars, and no not all of them were uneducated bogans about what they believed I should be doing in that parenting moment. I have had people tsk at me under their breath as I dealt with an overwhelmed 4 year old. I have even had a woman follow me for 3 blocks screaming at me that she was going to rip out my reproductive organs because I missed seeing a car at a round about. I wonder through all of this, if they ever think about the impact their words and actions are having on the child they are supposedly trying to protect? The last incident we had was over 3 weeks ago. I made a snap decision to grab my son by the arm as he ran dangerously close to a busy road beside the bus stop we were sitting at. Based on that snapshot, a woman released a tired of abuse and threats (telling me I better watch out because she works for the government) for at least 5 minutes, until the light turned green. I had no where to escape to. I have seen that woman once since, and I had to hold myself back from letting her know about the impact her words and actions had on Mr 5. I wanted to tell her about the nightmares that he had about the woman stealing him and how we took a (rather expensive) taxi for the rest of the week because he was too scared to go to the bus. I wanted to tell her that my son suffers anxiety around adults and that her actions set him back in the progress going to school had made. Most of all, I wanted her to think twice before she did something like that again. Next time you see an overwhelmed mum, I ask you to put yourself in their shoes. I ask you to reserve the judgement and realise that you are only seeing a small amount of their parenting. Of course if you believe that the child is being abused (and that is serious allegation to make, so please be sure) then do something, but don’t do by berating the parent in front of their child. You just have no idea the impact those words can have on a small child. You just don’t know if those words are enough to push a fragile parent over the edge. 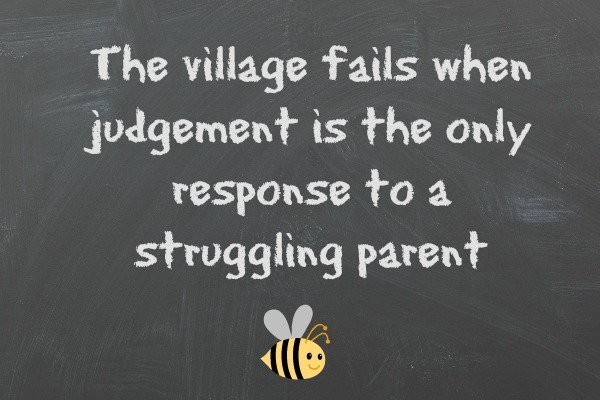 When was the last time you faced judgement as a parent? This entry was posted in Parenting and tagged am I good enough, IBOT, kids, mental illness, parenting on March 10, 2015 by Tegan. Oh my Gosh, Tegan You’ve really had some bad experiences I can’t believe a woman followed you and screamed at you for three blocks. Unbelievable. I’m so sorry to hear about this recent incident and how upset Mr 5 is. You must have been furious and so upset that it has affected him so much. I hope this upset passes soon. I’ve not had anything like this. Only a few looks at the supermarket. Take care, lovely. Three kids in, I’ve learnt to keep my mouth shut (except when child is unattended) – I seem to find ‘lost’ children regularly, and kids locked in cars. I’ve also learnt to shut ‘well meaning advice’ down. I give the parent of the hysterical child the sympathetic nod of recognition, cos we’ve all been there, and am thankful when it’s not me. Not nice at all Tegan. I can’t believe some people really. Fortunately I haven’t faced any direct judgment that I can remember, although the ‘tsks’ under the breath and eye rolls, yes. For the most part I ignore it, but if someone were to speak their mind and their so called ‘well meaning advice’ I’d really find it hard to hold back from ‘telling them’. “Don’t judge another, until you’ve walked in their shoes” – I try really hard to remember this myself. It certainly seems like you have copped a lot. I have seen other parents be “attacked” and I am thankful that no one has ever dared to say anything to me because as a protective mumma bear I’m not sure I could hold back. I feel so sorry that your son was so heavily impacted by this woman’s words. People need to learn to stop and think. Words are very powerful things. It’s been awhile since I have been judged as a parent because my kids are older now BUT as the mother of a boy with Aspergers, I have certainly been on the receiving end of it many times – particularly through the primary school years. As a traumatized child reacting to bullying, some only see the reaction – not the cause. I could write a book! After following so many wonderful parents in the blogosphere who have educated me on all sorts of childhood (and parenting) challenges I do not judge. We never know what someone else is going through until we physically walk their exact path. I get judged on my parenting of my teen daughter … the model … because she’s a teen and a model. But they don’t know our story, nor my daughter’s passion, nor her drive, nor her talent … nor do they hear the talks and see the reading we do behind the scenes to ensure she is safe and healthy. No one is game enough to say anything to my face though … but I have heard the whispers. It can hurt … and I want to get defensive … but in the end we just try and stand taller. Tegan that is terrible! Her words were not acceptable at all! despite and especially because of their consequences to your son. I think in general, almost in everything that we do, humanity is losing its compassion, respect and kindness. Not only do we think it is ok to judge and lament others -we feel that it is our entitlement to and therefore it has become the reflex action of this generation. Next time you do see her – have a quiet word…perhaps we need to turn the wheels the other way – one person at a time? A friend of mine posted on Facebook this morning that ‘women will never achieve equality with men while we continue to spend so much time tearing each other down’. She’s so right. Women can be so horrible to each other, and for what? Jealousy? Self-righteousness? Validation? Oh that story really upset me Tegan. That’s not ok for you or him. If he had run out on the road what would she have said then? I think sometimes we think in this day and age that we all have a say in everything, but we don’t. We don’t get to attack or judge a person based on a snapshot. You’re so right in saying that. I am so sorry people feel they can add their unasked for input into your life about parenting. I have been lucky and been spared. I have to admit I’m sometimes prone to judgement but I bloody well keep it to myself. Or vent on Twitter like normal people. No kids, so no one to judge my parenting skills, but I think some people can’t help but interfere no matter what. Some of my friends are a bit judgey about my decisions re work etc. And of course I can’t help but groan when I constantly get suggestions about dieting and exercise. Like I haven’t thought of them before! Argh! Wow that is extreme Tegan! You poor thing to have experienced that. As for judging parents, it’s a big trap to fall into. We are all doing our best and you are right that when a judgement is made they don’t have the full story. I totally agree. I’ve been judged quite a few times by other parents when out in public either because bub drinks formula (which she has to due to severe food allergies) or because shes having a meltdown. I always feel bad enough without someone else sticking their two cents in. I can’t believe she scared him that much stupid cow. That’s terrible! For the record, I think grabbing your son’s arm was a sensible thing to do in the circumstances. But regardless of whether or not she agreed with your actions, she had no right to be so abusive. I’m so sorry for the impact that it’s had on your son and hope he can regain some confidence soon. Words are so powerful, I think we have a responsibility to use them wisely. I think if you do see that woman again you should hand her a link to this post, although given her judging nature, she would possibly go through the blog with a fine and judgmental tooth comb. It is heartbreaking to hear that he has been affected so much from that incident. I just read the article you linked to and it is so right. We all have things going on in our lives, some issues are bigger than others and some will last longer than others too but what is important is that we know in ourselves that this is the choice that we are making at the moment and we need to have confidence in it. Not everything we do is the best that we can, or the best thing we could do at that moment and we all definitely make mistakes, but we need to support ourselves with our own decisions too. At times we can be our most harsh judgement too. I currently walk 1.1km to school each day and because I have C with me, it is 2.2km for him there and back both in the morning and afternoon. He turns 4 next week and he sits in the pram most of those trips. Some days we are running late and it is the easiest way to make sure we are at school on time, sometimes he doesn’t want to take M to school and others he just doesn’t want to walk. Yes, I could make sure I am ready earlier, and I could make him walk, but I also enjoy being able to walk at a faster pace as this is my main source of exercise and I also love that I can have a conversation with him the whole time because guess what **GASP** I have him facing me in the pram **GASP** I must be treating him like a baby and not giving him the opportunity to be independent or to walk as he is clearly old enough. Pfffft! I can hardly hear C talk when he walks with me and I spend half the time bending down asking him what he said. I love this time bonding with C while he sits in the pram facing me and talking away. He is also allowed to get out if he chooses to walk, which he does once they get in the school grounds as M has put his bike away and now walking too. Both of them both walk the ‘other’ path to meet me at M’s favourite plant. I cannot see them for these 2 minutes as they are walking unsupervised on the other side of the classrooms **GASP** lol. People will also drive past me and see that there is a young primary school student racing his bike up the foothpath ‘inadequately supervised’ as he is sometimes 100+m ahead of me and I don’t care because I know he is safe. We are fortunate enough to have access to a path that runs alongside a busy road where we don’t have to worry about driveways and the path is about 10m from the road. M is allowed to ride the 100 odd metres to the bus stop and then TURN AROUND AND COME BACK TO ME! and then set off again. As we approach the bus stop he is allowed to go to our next check point and either stay there and wait or return to me. I have not experienced any judgement to my face, but I do know that some of those in the cars driving past would no doubt be muttering at me behind their wound up window. And some of the parents no doubt look at me with some sort of disgust when they realise that the seat of the pram that is facing me has a large enough child that his legs are well and truly bent to rest of the foot rest. AND I DON’T CARE 🙂 I make decisions for my family based on MY FAMILY and I have faith in the choices I make.